If you are human, it is very likely that you have traveled a far distance before, whether by bus or by plane. One common grievance of long-distance travelers is cramped spaces which causes numb, uncomfortable and painful feet while staying in one position for a long time. In order to get enough blood into the feet, the feet needs to be considerably outward and not directly under the knees (knee angle should be greater than 90 degrees). Just as it would be difficult sipping juice with a bent straw, it would also be difficult to get blood through your veins if your knees are too bent. One thing most long-distance travelers do is to find an elevated surface to rest their feet on, like a rod under the seat in front. Leggage aims to solve this problem by making laptop bags which have feet rests on one side of them. 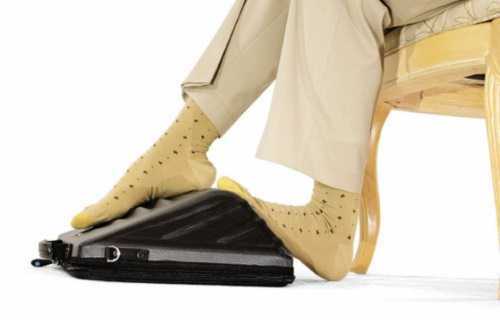 The elevated sides make it a foot rest to improve blood flow to the feet, while the creases on the surfaces can be used as a foot massager. The laptop case is a good idea; this is so people would have a reason to carry them along, and also make them useful off journey. Along with your laptop, the bag also has room for other things like power chords, mobile phones, chargers, notes e.t.c.